Exhausted from the siege, beset by sorcery, and vastly outnumbered, the Company have risked their souls as well as their lives to hold their prize. But this is the end of an age, and great forces are at work. The ancient race known as the Nyueng Bao swear that ancient gods are stirring. the Company’s commander has gone mad and flirts with the forces of darkness. Only Murgen, touched by a spell that has set his soul adrift in time, begins at last to comprehend the dark design that has made pawns of men and god alike (goodreads.com). I read the previous book in this series quite a while ago so I had to go back and see how it ended. Definitely on a big cliffhanger, but this book didn’t really satisfy me. 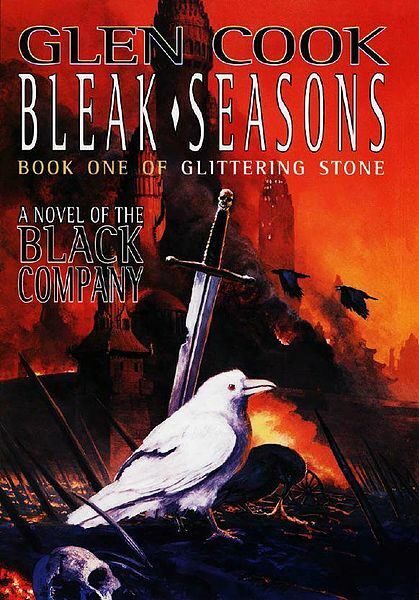 I would have to say that Bleak Seasons is the worst of the Black Company books so far. I am hoping that book two of the Glittering will be better. We will see. The book does add a little to the story of the Black Company, but this particular book was rather slow and complicated. There were of course some good parts, but most of it was actually kind of boring. I am hoping the pace picks up a little in the next book. This is the first book written in Murgen’s point of view, and I can say that I really didn’t enjoy reading from his perspective. I enjoyed Croaker the most and Lady was a great narrator too, but I just couldn’t get into Murgen’s story. I guess I just don’t know him well enough to make him feel as important as Croaker and Lady, if you know what I mean. Not enough character development before switching to him as a narrator. Reading from his point of view just wasn’t that interesting, not to mention that it was incredibly confusing. Apparently, Murgen is under some sort of spell, which forces him to jump though time (back to events that take place in Dreams of Steel) and I thought it was really complicated to figure out in which time I was reading. It was constantly back and forth. Ugh! I guess this was also why I didn’t like reading from Murgen’s perspective. This time shifting just interrupted the flow of the story. Maybe it would have helped if these two different time periods were in separate books. I think that would have made it a little less confusing and an opportunity to add more to the story. Except for One Eye and Goblin, none of my favorite characters play much of a role in this novel. It was pretty disappointing not being able to read about them. 😦 Also, One Eye and Goblin weren’t as entertaining as they usually are. Don’t get me wrong. They were still up to their shenanigans, but not like the first few books in the series. If you are enjoying the series so far I would still suggest reading this one if you want to continue on. Wish it would have been more interesting. I will let you know if the next one is any better! Recommended edition of this book is The Return of the Black Company, which includes both parts to the Glittering Stone in one edition.